For the 2017 season, the Honda 150 European Championship joins forces with, Netherlands-based, HGS exhaust systems. The 30 selected riders for the 2017 season were able to familiarise themselves with their identical Honda CRF150R machines, fitted with HGS exhaust systems, at the lovemytraining pre-season training camp in Boves, Italy (28-30 April). This was also the first chance that the 11-14 year olds were able to size up their opposition for the year. Henri Gorthuis, who utilised knowledge gained through his experience working as a Grand Prix mechanic to create his exhaust systems, formed HGS in 1988. 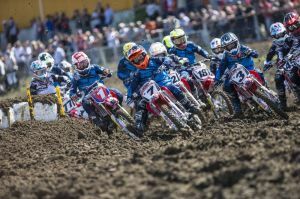 Now, HGS supplies all Honda Europe MXGP, MX2 and EMX250 teams; allowing the ‘talent of tomorrow’ to have another slice of factory support on their CRF150R machines. The riders will now be looking forward to the first round of the season at Teutschenthal, Germany (20-21 May). Visit www.honda150championship.com, Facebook, Twitter and Instagram for more information, news, photos and videos.